A new report from Gov. Tom Wolf's administration sets a target of 10 percent solar power in Pennsylvania by 2030. 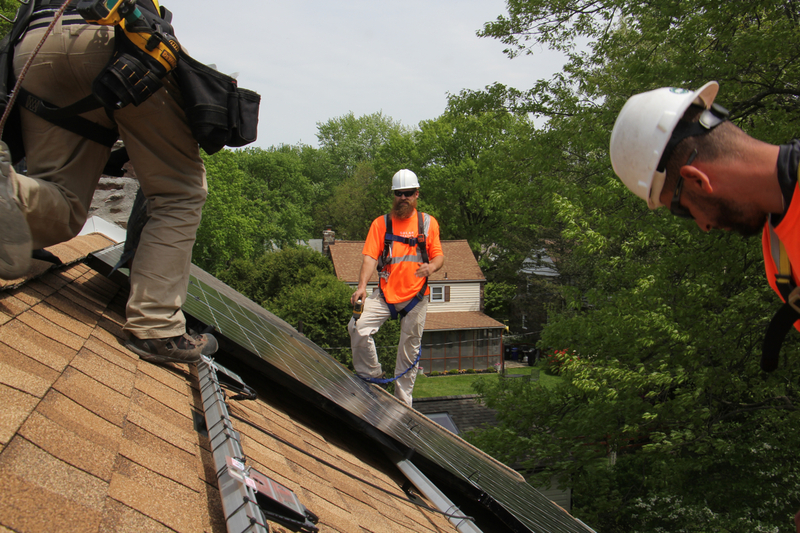 Dennis Hajnik (center) directs a solar panel installation in Bryn Mawr. Philadelphia’s plan to cut its carbon emissions now includes a proposal to purchase energy from a massive solar farm in south central Pennsylvania. The proposal is part of the city’s plan to use renewable energy for all city operations by 2030. If approved, the solar farm in Adams County, near Gettysburg, would be the largest in Pennsylvania. Christine Knapp, director of Philadelphia’s Office of Sustainability, says the 70-megawatt facility would help the city reach its renewable energy goal. “We would like to do something like this inside the city as well, we just don’t have as much abundant and cheap land as there is in Adam’s County,” said Knapp. Knapp says the city will buy all the energy from the facility under a 20-year-deal fixed at current rates. She says hopefully that will mean savings in the future when conventional energy costs are expected to rise. “The cost is about the same as what we currently buy, so that’s what’s making the economics work for us,” she said. Philadelphia City Councilwoman Blondell Reynolds Brown introduced a bill on Thursday that would allow the city to enter into a power purchase agreement with the Philadelphia Energy Authority, which will work with Adams Solar LLC, an entity of national solar developer Community Energy. “Moving forward in a tangible matter with this goal symbolizes how we grow towards a greener and more sustainable Philadelphia,” Reynolds Brown said in a statement. City officials say job fairs for workers on the project would be held in both Philadelphia and Adams counties. Last month, Philadelphia became one of 20 cities awarded about $2 million as part of the Bloomberg American Cities Climate Challenge, which includes the development of renewable energy. WHYY’s Tom MacDonald contributed to this piece.